We show that verifiable secret sharing (VSS) and secure multi-party computation (MPC) among a set of n players can efficiently be based on any linear secret sharing scheme (LSSS) for the players, provided that the access structure of the LSSS allows MPC or VSS at all. Because an LSSS neither guarantees reconstructability when some shares are false, nor verifiability of a shared value, nor allows for the multiplication of shared values, an LSSS is an apparently much weaker primitive than VSS or MPC. 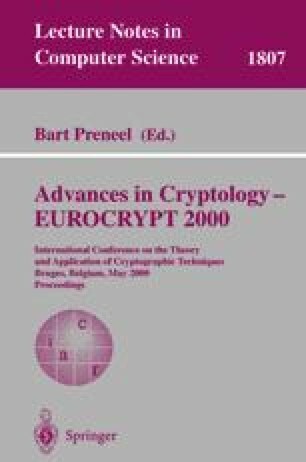 Our approach to secure MPC is generic and applies to both the information-theoretic and the cryptographic setting. The construction is based on 1) a formalization of the special multiplicative property of an LSSS that is needed to perform a multiplication on shared values, 2) an efficient generic construction to obtain from any LSSS a multiplicative LSSS for the same access structure, and 3) an efficient generic construction to build verifiability into every LSSS (always assuming that the adversary structure allows for MPC or VSS at all). The protocols are efficient. In contrast to all previous information-theoretically secure protocols, the field size is not restricted (e.g, to be greater than n). Moreover, we exhibit adversary structures for which our protocols are polynomial in n while all previous approaches to MPC for non-threshold adversaries provably have super-polynomial complexity. Supported by the Swiss SNF, grant no. 5003-045293. Supported by the Swiss SNF. (Basic Reseach in Computer Science, center of the Danish National Research Foundation), work done while employed at ETH Zürich.